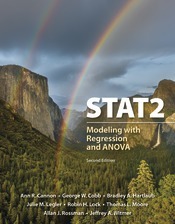 STAT2 introduces students to statistical modeling beyond what they have learned in a Stat 101 college course or an AP Statistics course. Building on basic concepts and methods learned in that course, STAT2 empowers students to analyze richer datasets that include more variables and address a broader range of research questions. Other than a working understanding of exponential and logarithmic functions, there are no prerequisites beyond successful completion of their first statistics course. To help all students make a smooth transition to this course, Chapter 0 reminds students of basic statistical terminology and also uses the familiar two-sample t-test as a way to illustrate the approach of specifying, estimating, and testing a statistical model.Using STAT2, students will:Go beyond their Stat 101 experience by learning to develop and apply models with both quantitative and categorical response variables, and with multiple explanatory variables. STAT2 Chapters are grouped into units that consider models based on the type of response and type of predictors. Discover that the practice of statistical modeling involves applying an interactive process. STAT2 employs a four-step process in all statistical modeling: Choose a form for the model, fit the model to the data, assess how well the model describes the data, and use the model to address the question of interest. Learn how to apply their developing judgment about statistical modeling. STAT2 introduces the idea of constructing statistical models at the very beginning, in a setting that students encountered in their Stat 101 course. This modeling focus continues throughout the course as students encounter new and increasingly more complicated scenarios. Analyze and draw conclusions from real data, which is crucial for preparing students to use statistical modeling in their professional lives. 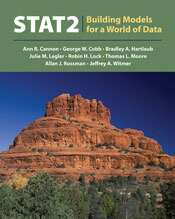 STAT2 incorporates real and rich data throughout the text. Using real data to address genuine research questions helps motivate students to study statistics. The richness stems not only from interesting contexts in a variety of disciplines, but also from the multivariable nature of most datasets.